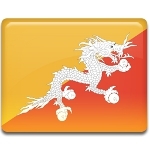 Druk Gyalpo (Dragon King) is the official title of the King of Bhutan. The Bhutanese monarchy was established in 1907 by the House of Wangchuk. The first Drug Gyalpo was Ugyen Wangchuk, who unified the country and established the new dynasty. Jigme Khesar Namgyel Wamgchuk was born in 1980 to the fourth Druk Gyalpo and Queen Tshering Yangdon. Having completed his higher secondary studies in Bhutan, he studied in the United States and United Kingdom. The Crown Prince often accompanied his father and represented Bhutan on international events. For instance, in 2002 he made his first speech at the United Nations General Assembly. Originally, King Jigme Singye Wangchuck planned to abdicate in the favor of his son in 2008. However, he changed his plans and abdicated in December 2006, making Khesar the de facto head of state. Official coronation of the fifth Druk Gyalpo took place two years later, on November 1, 2008. Its anniversary was designated as a public holiday.